Smartphones such as iPhone® and AndroidTM have very controlled and secure operating systems. Mobile Banking uses 128-bit SSL encryption just like Online Banking, which basically encrypts and protects any transmission of data including customer account information. Mobile Banking uses your access ID and password for access. Just like Online Banking, your account will lock down after three (3) incorrect attempts from your mobile device. 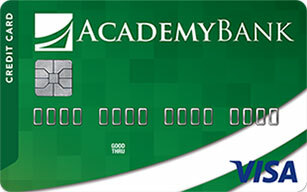 Text messages are not secure, which is why Academy Bank will never send your name or account number through a text message. For more information, see our Mobile Security Tips. What should I do if my phone gets lost or stolen? Remove your mobile banking number from your Mobile Banking profile within Online Banking or call customer service at (877) 712-2265. As always, you'll want to monitor your accounts for suspicious activity. If you notice anything that concerns you, call us right away at (877) 712-2265. If my phone gets lost or stolen, is my Mobile Banking account info safe? Nobody wants their phone lost or stolen. But in the rare case that it is, you should know that your Mobile Banking access is secured. No personal information from your Mobile Banking account is ever stored on the phone, and your password is never stored. Your login session automatically times out after 10 minutes of inactivity.